It’s the largest pedestrian square in Europe. So whether you want to get to the Tourist Information centre inside, join a march, jump on the big wheel, or just simply sit, this oversized square reinvigorates the lungs and stretches the horizons. 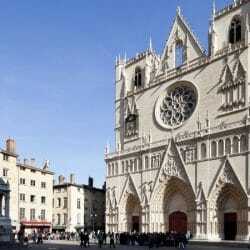 Part of the UNESCO World Heritage Site, between the Saône and the Rhône in the 2nd district of Lyon, Place Bellecour in a gigantic dusty red square right in the middle of the city centre, just north of the Ainay district. 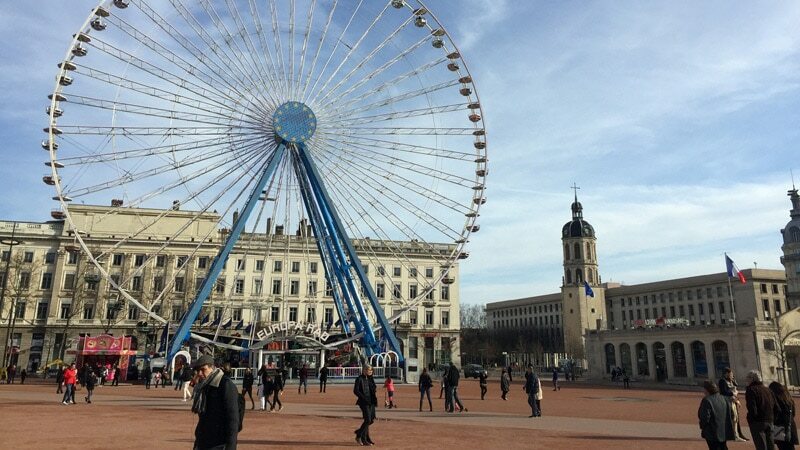 As the central focus of shopping on the presqu’île and the chosen starting point for most city visits, Bellecour is the kilometre 0 of Lyon and all distances are calculated from it. Four major streets start from this famous square: rue de la République, which takes you up to Hôtel de Ville and the Opera; rue Victor Hugo and rue du Plat both leading to Perrache; and rue du Président Édouard Herriot, with a concentration of luxury shops all the way to the Place des Terreaux. 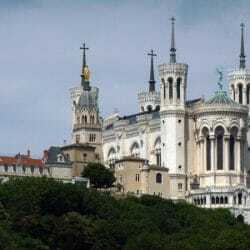 The Vieux Lyon district and the Lyon Cathedral face the square over the river Saône, and high up is Fourvière, looking down on us all. Surrounded by linden trees, wild cherries and beautiful Napoleonic buildings, Place Bellecour is the third largest square in France after Place des Quinconces in Bordeaux and Place de la Concorde in Paris, measuring 312m by 200m, not to mention the biggest pedestrian square in the whole of Europe. Fact. In its centre is a much-loved statue of Louis XIV on horseback where locals meet, protesters parade and tourists learn a little history. Another statue, representing the Little Prince and the famous Lyonnais Antoine de Saint-Exupéry, is to be found in the south-west part of the square, created in 2000 to mark one hundred years since the writer’s birth. Right in the centre lies the statue of the Sun King, Louis XIV, on horseback, created by François-Frédéric Lemot and brought to Bellecour square in 1825. It took twelve days, twenty-four horses and who knows how many people to get it here. When the statue poked its head inside the city, it was greeted by the Lyon population with wild applause, turning its arrival into a colourful event. Rumour still has it though that Lemot committed suicide shortly after it was installed as he had forgotten to put the King’s stirrups on. This was soon to be officially disapproved when people argued that the King would have ridden ‘Roman-like’, without stirrups, thank you very much. Suicide was refuted further when it was said he happily died of natural causes a few years later. The rumour persists, however, as most gossip does, together with its nickname “The Bronze Horse”. The origin of the nickname dates back to 1848 when the revolutionaries scratched off its Latin inscription. Nowadays, locals not only call it The Bronze Horse, but meet-up points are given under its tail, or “sous la queue du cheval”. Just as well there’s enough space in the square to fit a whole city inside. On the corner of rue Gasparin, built into the building, a Gulliveresque statue called the Veilleur de Pierre (Stone Watchman) stands at the precise point a bomb was set off by the French resistance on 26th July 1944. The target was the Moulin à Vent café, a place frequented by Nazi officials and members of the Gestapo. There were no victims in the explosion, but the act fuelled harsh retaliation the following day. Five members of the resistance, detained at Montluc prison, were executed by the Gestapo at the same spot as the explosion went off. And the bodies were left in the sun as a warning for all to see. This simple yet powerful memorial is by Louis Thomas and the sculptor Salendre, inspired by Donatello. The five names of the resistance members can be found, along with the places where other massacres took place in the Rhône during the Second World War. Every 27th July a memorial is placed in front of the monument to show that the city still remembers. So take the above, and put it together with two pavilions for Lyon’s Tourist Offices, a park for kids, a fountain, a flower market, two outdoor restaurants, a big wheel and an ice-rink in winter, a yearly pétanque competition, concerts, a book festival, a Fan Zone for the Euro 2016, and you have yourself a subtly majestic must-see city square. Tip1: Brush shoulders with local lawyers and chic folk of Lyon in Café Bellecour or l’Espace Café and watch the world go by inside the square. Tip 2: For English-speaking books, wander the aisles of Decitre, an international bookshop, Made in France.